Looking at a boat - a 1979 ABC 40' tricabin ... ABC apparently stands for Aquastar Boat Corp. It is powered by the 120 Lehman and seems like modeled like most of these boats, but any info at all would be helpful. I have found these boats under lots of names but have not seen any ABC's ... so would like to know more if anyone does! 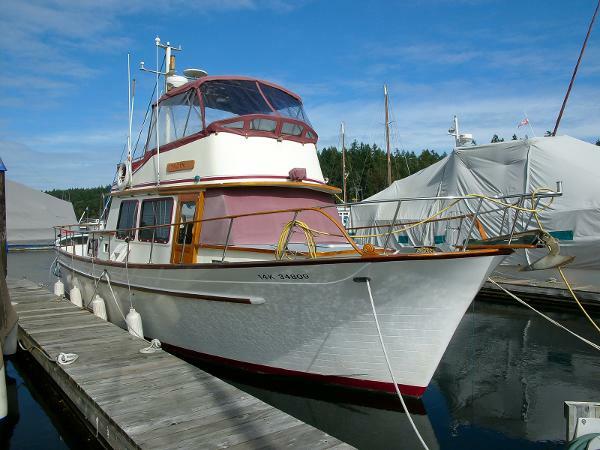 Also if anyone knows of a good surveyor for Tawain built trawlers in Nanaimo BC or close by that would be GREATLY APPRECIATED.. Thanks - and perhaps the AlaskaDream will soon be realized! Welcome aboard. ABC? As in simple as...? From what little I understand and comprehend, during the early 70's to early 80's, anybody and his brother in Taiwan, could buy a hull or two or twenty from one of the Taiwanese manufacturers (Albin, CHB, for example), finish it to ?? standards, slap a model/yard/company name on the build sheet and be pretty well guaranteed to make some $$ selling it in the USA. I've seen the exact same Marine Trader (MT) year and model with two different hull shapes and interiors. Using MT as an example, they might decide to "build" 40 boats (marketed under the MT banner). They would get hulls wherever they could, get them finished by whomever they could and ship them off to Tom's River, NJ and sell them there. Could be your ABC had a short history and maybe only marketed 4 or 5 boats and then moved on. This is not to say an ABC is a substandard vessel but would explain the scant information you're able to dig up. ONLY a good survey will tell you what you really should know. RT is right. It is my understanding that many of the builders were related in some way or another and would trade designs, blue prints etc. After you have seen a lot of these boats as I did you start to reconize the same sdesins on differant manufactures. Actually it stands for the Aquastar Boat Company based in St Peter's Port in Guernsey in the English Channel Isles. The company is still very much in business. Google them for more info with all your boat details. So perhaps this company like others had a hull or two done in the Taiwan market. Would be great if it meant this boat had excellent quality control, but it has had the decks redone. It says the tanks are 'painted welded mild steel' so not sure if those were redone or not. Thanks for the lead though - will see if I can figure out if they are the same company or if this boat was from a small company that just did a few hulls. The surveyor could be incorrect, specially if he was unfamiliar with the company or the brand. What are the first 3 letters on the HIN? That might give you a clue but my TT's first three letters don't accurately reflect the manufacturer in the USCG database. The Hull ID number is ABC7083807. It is a Canadian boat - but likely the USCG database have some listing for all boats? How would I look to see? Thanks for the info - interested in exploring further, especially since the name of the boat (don't know if it is original name though) is a Galic word! Based on the two photos Andy put up there are features on this boat that remind me of some of the earlier Taiwan Trawlers like CHB. Notably the sliding, bright-finished doors, the large wood frames around the cabin windows, and the Grand Banks-type hand rails that dip to the cap-rail, end in a curlycue and form an attach point for the stainless bow rail. As others have said the boat building process in Taiwan in the 1970s and 80s saw hulls being molded by larger boatyards and then farmed out to small, familly-owned yard for completion. This process meant that the quality of the boats varied all over the place, even within the same brand name and model type. The name notwithstanding the boat has so many characteristics of the dozens of brands of cruisers being turned out in Taiwan during those years that were I to see it sitting in our marina I would immediately take it for one of these boats. Why the yard that built the boat used the name of a company apparently based in Europe is anybody's guess. Perhaps a joint venture, perhaps a basic name rip-off, perhaps an attempt for a European company to produce a competitive product. There's an answer out there somewhere. As to the build quality of this particular boat, a survey by a competent surveyor should go a long ways toward determining that. Do you know what "decks redone" means in this instance? Pretty sure the decks redone means the teak removed ... it is definitely removed and the windows were all replaced with painted aluminum windows. So it seems like the things I have learned to look for on a Taiwan trawler have been dealt with. Okay, so may really show my lack of knowledge here, but what is engine overspray ... other than what happens when you paint an engine, I am not sure what that refers to. Having both a mechanical survey given the high hours and think I have found a surveyor who has a good handle on what to look for on these boats. Crossing fingers I he is an excellent one! Man- I don't know Marin. I've got a CHB and I'm not seeing anything that ties this boat to one. The hull is wrong (entry is too fine), the interior doors are wrong, even the the trim profile around countertops and flat areas is wrong. This may be something else. I must have overlooked the engine overspray comment. The engine looks great and has had some time spent on it being detailed is my guess. It certainly doesn't have the carved doors that I have seen in many, and when i was aboard, the master cabin head is also smaller - no 'tub' which I have seen on lots of the 36' boats. It is a very good looking boat. Good luck! Man- I don't know Marin. I've got a CHB and I'm not seeing anything that ties this boat to one. I was just going off the first photo Andy put up. But I have to admit that to me ALL the sliding-door Taiwan-type cruisers look like CHBs to me. It's not a genre of boat I've paid any attention to other than superficially. So I couldn't tell you if the entry of a CHB is fine, fat, or medium. We were temporarily moored in a slip next to a CHB a couple of years ago as they were finishing installing our new dock, and the boat in Andy's photo looks "just like that one" to me. To someone who knows CHBs well there probably are all sorts of differences between this "ABC" boat and a CHB. 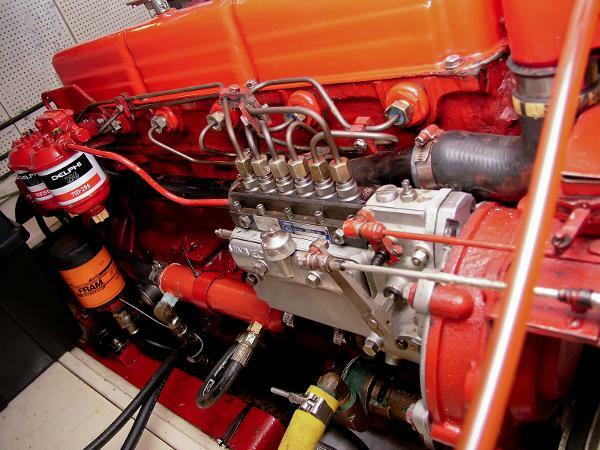 Regading my 'engine overspray' comment, it came from the ER photo from the dealers site.Sorry it was not one of the photo's I posted.I will see if I can get it up. Top right of the photo seems to show some repainting where the head bolts to the block, may be nothing of course. FWIW, I also think the boat has many of the Asian style finishing that were so common in the 80's. Lots of Teak. Looks a nice boat all in all from the photo's. Sorry, I could not find ABC in the USCG manufacturers identification code. If it was an Aquastar made or imported into BC, the three letters would be ZAO or ZIA. Your HIN number seems to be of an invalid length so couldn't find anything on it. Most Taiwanese boats are not there. My Taiwanese Tub (TT) is not there. From the pics at Calibre, it does look like a typical TT. Very nice looking boat priced very reasonably. Was looking thru my old history files and found this that was posted back in 1998 or so on Yahoo. "Chung Hwa (CHB) entered the U.S. market in the early 70's with the 34 badged as "ABC Yacht". It was so bad they are still embarrassed when these boats are mentioned." I have no way of knowing of the truth of that statement. I have never owned a TT or anything close to it and this is not a knock on those boats. I've seen some really cool TTs that were "beautiful" that almost anyone would be proud to own. (I don't consider a Halvorsen or Island Gypsy a typical TT boat.) 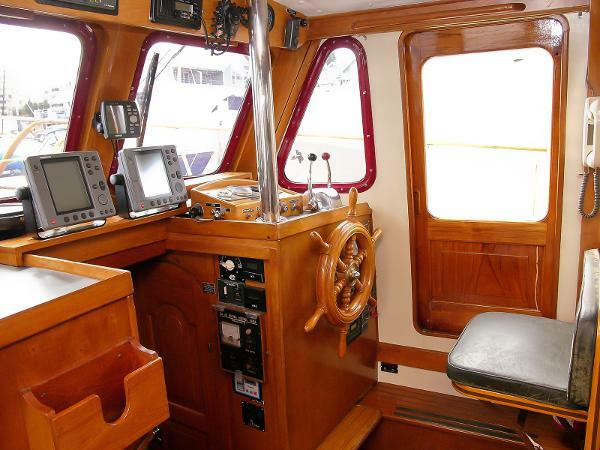 I will say that upon reviewing the listing, this appears to be a very nice boat that has been well cared for which IMO is the most important thing to look for when buying. To get all tangled up in your underwear researching the pedigree of the boat is an exercise in futility. As mentioned several times in this thread, have a qualified surveyor pour over the boat and if he/she thinks it's sound...BUY IT! The same with me. My boat manufacture is "Camargue" which is also a french boat manufacture.